Can the flow of words, the rhetorics as displayed in Italian politics - dominated by male leaders - be changed by the main actors that have been voted into parliament in February 2013? Will Beppe Grillo act like 'the wise cricket' in the Pinocchio tale and change the tone and content of the debate, opening new doors to an era beyond the discourses of Berlusconi con sui? Most people only know the Walt Disney interpretation of the original Italian story by Carlo Lorenzini, 1826 – 1890, "Le avventure di Pinocchio." The cricket that appears in it is called "Il Grillo Parlante" and is described as "gentile, generoso, saggio, preoccupato, riluttante, severo ed intelligente" (friendly, generous, wise, preoccupied, ungrudging, strict and intelligent). Il Grillo Parlante tries to appeal to the good feelings of the wooden marionette that becomes human, as he warns him several times. These warnings are neglected at first, 'il grillo' is even dismissed in his role of educator. But in the end there is the repentance of Pinocchio and the value of the wise cricket is recognised. 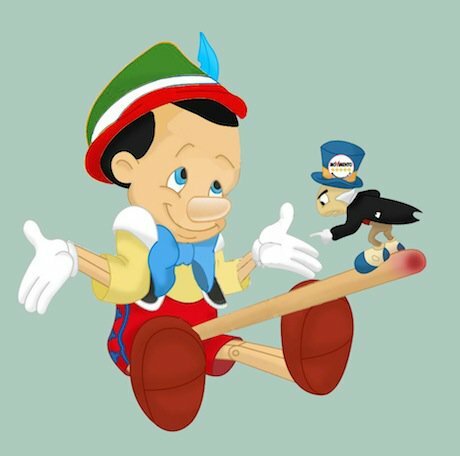 Pinocchio is depicted here as the Italy of Berlusconi, full of phallocentric lies. Will Beppo Grillo who seems to be in his methods a mirror image of Berlusconi, indulging in his overwhelming monologues addressed at admiring crowds, really do anything different? Will the 'grillini' - as they call themselves - develop their own discourse, local and national? All the signs are that the movement led by Beppo Grillo is first of all a 'reaction movement', blown into existence in response to the blunt lies and bad practice of Berlusconi and his allies. More is needed than just reacting. A coherent practical vision on what to do with Pinocchio-land, how to wrestle with the stock-exchange and EU financial power structures, at first all united in their scandalous disapproval of what - whatever one says - has been a democratic election by the people of Italy of a new government.